The RASC | A promise fulfilled – A friend honoured. A promise fulfilled – A friend honoured. Darwin in 1998, organised by the then Hon. Secretary John Anderson, saw the start of younger delegates from developing countries both attending and speaking at Conferences. Norah Ebukalin, aged 32, was the delegate from Uganda. John gave me the responsibility of looking after Norah and the other young delegates. I promised her then that one day I would visit her in Uganda. 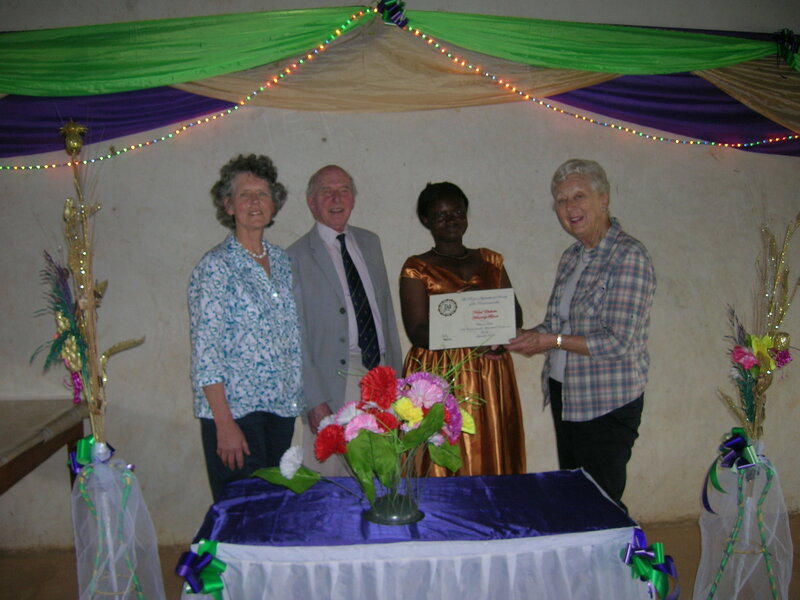 January 2013 saw that promise fulfilled when, with John and Jane Anderson, I visited Bukedea (East Uganda) where Norah and Sam, her husband, farm. In the mid 1990’s, Norah ,recently returned from exile in Kenya, had set up a Women’s Farming Co-Operative (Popular Knowledge Women’s Initative – P’KWI) with 12 households, aimed at increasing their incomes by sharing costs, improving livestock and Adding Value to their crops. Currently P’KWI has 2500 households involved, all linked by mobile phones to a new Learning Centre. Key Farmer Trainers attend regular up-dates in the Learning Centre and pass this knowledge on to the 25 families for which they are responsible. Besides visiting selected Key Farmer Trainers on their farms, we were present for the official opening of the Centre now named after a past RASC Hon. Sec. Other imaginative projects are in the pipeline, including the milling of cassava for flour. 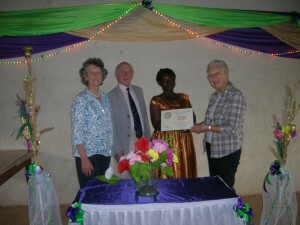 Over the years, Norah has received encouragement from the RASC which has benefited P’KWI members. She, in turn, has delivered papers at two Conferences on her experience in improving food security. The achievements of Norah and Sam more than fulfill the aims and objectives of RASC and Norah thoroughly deserves the honour we were able to present her with; that of being an Honorary Friend of RASC. Pamela M. Kimber with contribution from John and Jane Anderson.